A PhysicalNoise class is used to simulate a force field affecting physical bodies and particles based on a volumetric noise texture. It creates an additional distribution flow specifying the force and the displacement direction for bodies and particles at each point of the force field. The physical noise can affect only a cloth, a rope or a rigid body. Also you should remember that a rigid body requires a shape to be assigned. The physical noise will affect particles only if their physical mass is nonzero. In this example a physical noise node and 50 boxes, each with a body and a shape, are created. Generated boxes fall down under the set gravity and are affected by the physical noise as they get into it. Article on Physical Noise to learn more about the parameters. Constructor. Creates a physical noise node of the specified size. const Math::vec3 & size - Physical noise box size in units. Casts a PhysicalNoise out of the Node instance. Casts a PhysicalNoise out of the Physical instance. Sets the value of the force multiplier. float force - Force multiplier. The higher the value is, the higher the value of the resulting force that affects an object inside the physical noise node will be. Returns the value of the force multiplier. Force multiplier. The higher the value is, the higher the value of the resulting force that affects an object inside the physical noise node will be. Sets the number of octaves for the Perlin noise texture generation. It is not recommended to change this parameter in run-time as the noise texture will be regenerated and the performance will decrease. int frequency - Number of octaves for the Perlin noise texture generation. The minimum value is 1, the maximum value is 16. The higher the value is, the more details the noise texture has. Returns the number of octaves for the Perlin noise texture generation. Number of octaves for the Perlin noise texture generation. The minimum value is 1, the maximum value is 16. The higher the value is, the more details the noise texture has. Returns the noise texture image. Sets the size of the noise texture in pixels. int size - Size of the noise texture in pixels. Returns the size of the noise texture in pixels. Size of the noise texture in pixels. Sets the scale of the noise texture. float scale - Scale of the noise texture. The minimum value is 0, the maximum value is 1. Returns the scale of the noise texture. Scale of the noise texture. The minimum value is 0, the maximum value is 1. Sets the sampling offset that will be used for pixel sampling from the noise texture. This parameter can be used to animate a force field in run-time. const Math::vec3 & offset - Sampling offset along the X, Y and Z axes. Returns the sampling offset that is used for pixel sampling from the noise texture. Sampling offset along the X, Y and Z axes. Sets the size for the physical noise node. 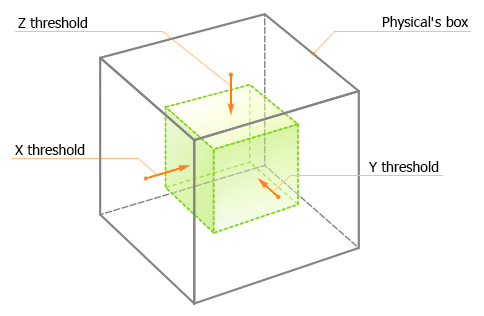 const Math::vec3 & size - Size of the physical noise box in units. If a negative value is provided, 0 will be used instead. Returns the current size of the physical noise node. Size of the physical noise box in units. Sets the sampling step that is used for pixel sampling from the noise texture. const Math::vec3 & step - Sampling step size along the X, Y and Z axes. Returns the sampling step that is used for pixel sampling from the noise texture. Sampling step size along the X, Y and Z axes. Sets a threshold distance set for the physical noise node. The threshold determines the distance of gradual change from zero to full force value. This values are relative to the size of the physical noise box. It means that the threshold values should be less than the size of the physical noise box. const Math::vec3 & threshold - Threshold distance along the X, Y and Z axes. Returns the threshold distance set for the physical noise node. The threshold determines the distance of gradual change from zero to full force value. This values are relative to the size of the physical noise box. It means that the threshold values should be less than the size of the physical noise box.